Beat the Heat: Top 5 Tennis Products for Heavy Sweaters! When the game gets real, make sure you’re physically and mentally prepared to safely bring your all! Fast players that give a lot to win, also lose a lot of water, sodium, and electrolytes as they sweat. Heavy sweater like me know how it feels to just lose all your energy in an instant. It can happen mid-rally or at any moment if the heat index is just right, so take learn about my top five products, available online and in-store, to use before, during, or after you’re trying to beat the heat! If you know in advance you’re going to be playing long matches or practicing for a few hours, then don’t’ sweat it! Just be smart and start hydrating (drinking more than usual) two to three days before you hit the courts. Athletes need to drink approximately 24-32 ounces of water ever hour of exercise, and more if it’s hot. So, take an insulated, wide mouthed water bottle – like the Hydro Flask 18 Oz Wide Mouth Bottle – with you everywhere though out the week! Carry it by the handle and start chugging long before your big day of play! Memorial Day weekend at the Tennis Express Academy, in-store, players stopped by to learn and ask about tools you can use to beat the heat. One of the most needed/requested items from that day’s lesson was the Mission Enduracool Large Tennis Towel. It’s a high performance poly/Nylon blend of fibers that instantly cool when wet. It’s great during tournament days when you can’t escape the sun! With this Enduracool Towel you can throw this over you and reduce your core body temperature up to 30 degrees and get UPF 50 protection. Just cool off for a few then it’s back to the grind! When I first started playing tennis I was not allowed on the tennis court unless I wore a cap! It’s the fastest way to protect your skin, crown, face and eyes from a direct beating from the sun. UV rays pounding on your crown send sweat straight into your eyes and down your cheek for a rather distracting game. Caps like the ASICS Fusex Jockey Tennis Cap have a dark underbill to reduce glare and laser cut perforations ensure ventilation. Stock up on colors for every outfit, or choose a washable fabric that will be good as new each outing! GU Energy Lab has the tasty ways to amp you up before you step on court and replenish all the good nutrients you lose during play! Products like the Hydration Drink Mix are designed to keep you hydrated. The powder mix restores the electrolytes you sweat out during exercise. Conveniently they are under two dollars a packet and the health benefits are a WAY sweeter than expected since they don’t use any sugary sweeteners. 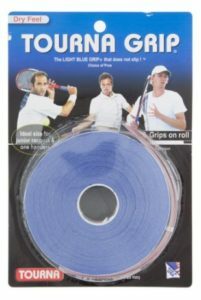 While players are caught up in tense, competitive points and exerting high energy running from line to line they can tear open the the Energy Gel Packs for help! With some that are caffeine free, the gel packs are great to pop in your mouth and swallow every 30-40 minutes during exercise. Nutritious carbohydrates help with your absorption and are recommended in post workout recovery. That feeling when the court drains all the energy from you can be scary and the thought of leaving the match forfeited is even scarier! For someone who is anemic like me, these quick packets really help me play the game I love longer and save myself the pain of a headache! When you’ve got the game on the line and the grip in your hand, don’t slip up with sweaty palms. Nothing is more frustrating than getting comfortable in your game and then feeling a slippery grip on your racquet. Two solutions to your sweaty palms, that you can use together if you need are the Tourna-Grip Tourna Tac. It gives a wet, sticky feel that is easy to grip and grips you back! If you live in more humid temps you’ll notice you’ll have to replace it often but the feel on your hands is secure, and worth it. I get mine in my favorite color for a little personality in my game. 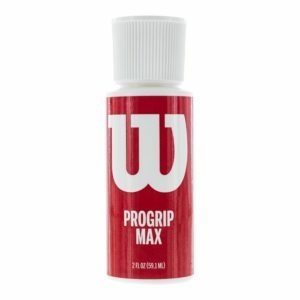 If you’re a heavy sweater and want to stop it from the source then the highly recommended Wilson Progrip Max Grip Enhancer. It may sound crazy, but it’s a non-sticky lotion that repels moisture to enhance your grip 75-100% in just 60 seconds after drying! What’s great is that you can still adjust your shorts or cap if needed without marking it with any visible product! Hopefully all our fast-paced and hard hitting players hit more comfortably, give more sweat-free high fives, and save yourself a clammy ride home!